Deni is a classic example of how companies can grow to deliver top line products through innovation and high quality design. Deni started the business as food vacuum sealer product about three decades back in 1980s, and today it is one of the best brands offering top line products in kitchenware. Given the history and the trend of Deni innovations, it is no surprise that their pressure cooker offering are dominated by Electric cookers. Deni has electric cookers ranging from 2 quart to 8.5 quart capacities. However, one of the most popular models is the Deni 9700 Electric 5-Quart Pressure Cooker. The 9700 Deni electric pressure cooker is a perfect cooker for any modern kitchen. It comes with the brushed steel exterior which gives it a very classy look. It also has a cool touch feature, which means regardless of how long the inner pot gets heated, the outer encasing will always be cool to touch. This avoids any accidental burns due to neglect. The unit also comes with four point safety features. There is a locking pin which ensures that the pressure cooker lid cannot be opened till the pressure inside falls to normal levels. If the pressure exceeds the threshold, the safety setting turns off the cooker. The cooker also has a pressure regulator knob that is pushed upwards when the pressure inside exceeds the maximum limit. Also, the design is built to push the inner pot down to release the excess steam from in between the pot and the gasket. All these ensure that the cooker always operates in safe conditions. It is not just the safety which is a highlight about Deni 9700, but also its user friendly features. The cooker comes with fully programmable timer which can be used to cook all kinds of foods. You can cook fruits and vegetables in a matter of minutes, fork tender stew in about half an hour and roast meat in about an hour. It is quick, convenient and versatile in usage. No wonder all the customers who have used this product are all praise for it. There are other useful features that ensure that you do not have to adjust your schedule to suit the cooking time, but have the cooker adjust to your activities. The delay timer allows you to set the cooking up to 8 hours away. Besides this, you also have the keep warm mode where you can keep the food warm if everyone is not yet ready for the meal yet. 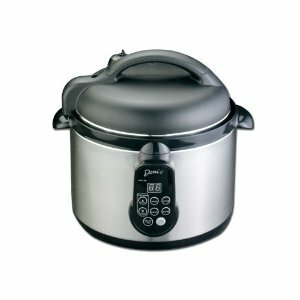 The 9700 Deni Electric Pressure Cooker is very easy to clean and is a mess free cooker. It comes with a condensation reservoir which collects the additional liquid that comes out from the cooker. So you have a clean counter and a clean cooker. Thus you have a great looking cooker set in a clean corner of your kitchen for years to come. Just to make life easier, Deni also includes an instruction book that provides you with cooking times for various foods and interesting recipes too.